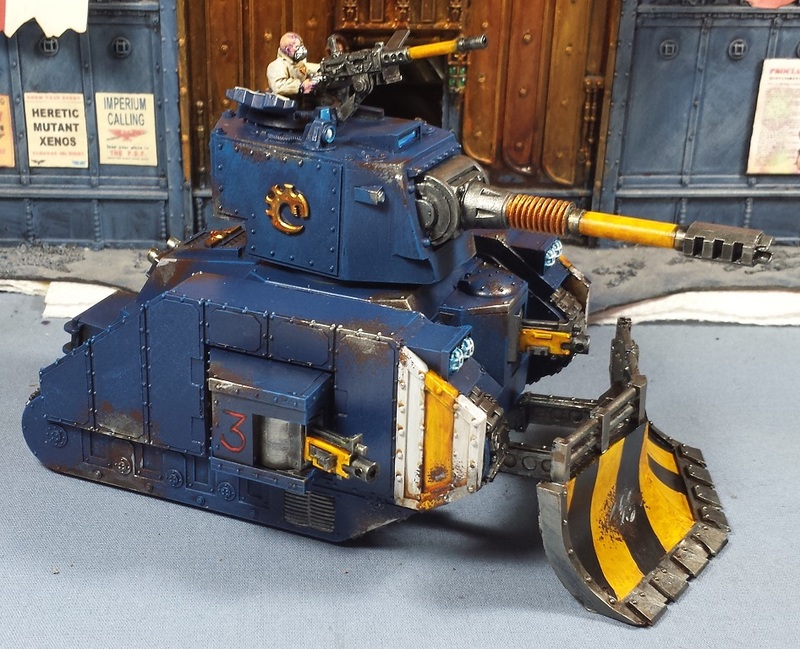 Mordian 7th Regiment: 40k Genestealer Cult - Leman Russ Exterminator painted! 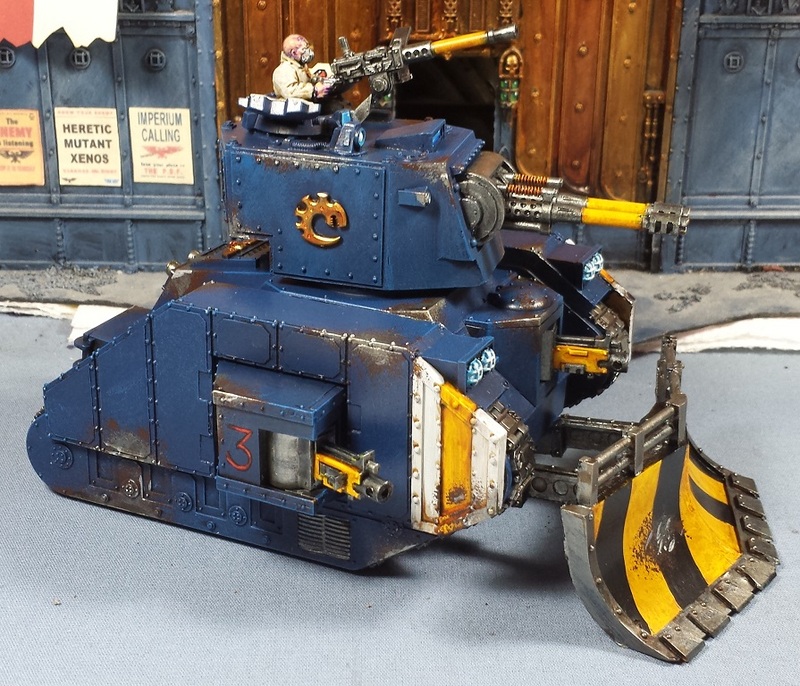 40k Genestealer Cult - Leman Russ Exterminator painted! Added in some stripes on the dozer blade to match those on the Rockgrinders, and laid in some further vehicle identifier stripes on the front of the side armour. Went with the bright blue-white halogen lamps to match the Rockgrinders as well (again, my usual yellow headlamps would get lost in all the other yellow bits). 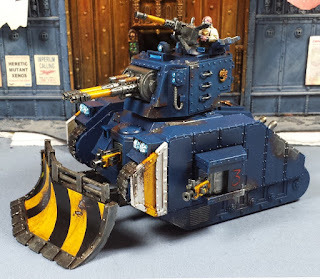 The turret weapons are magnetized so it can also be run as a Vanquisher should some more anti-tank firepower be needed. 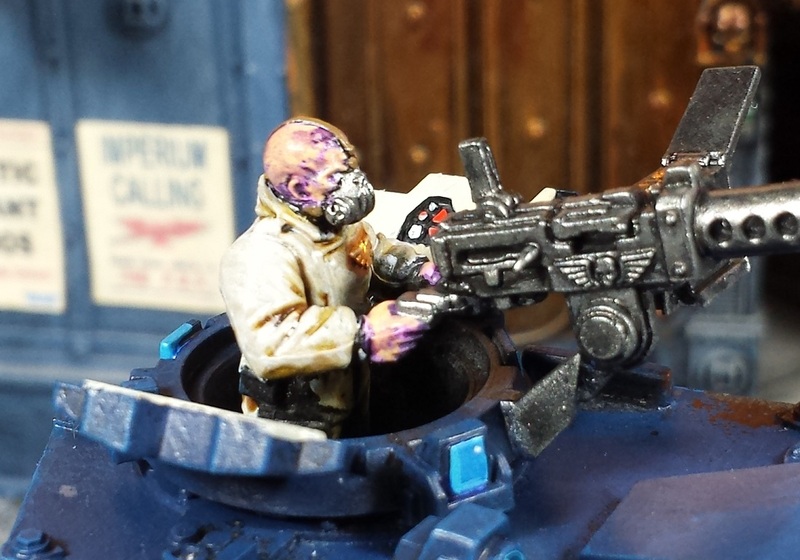 Tried out the dirty white recipe used on the Acolyte's armor on the tank crew's fatigues to help tie them together. After that it got some sponge weathering on various edges to dirty it up and it's good to go! May bounce back over to the Imperial Fists next and reward myself for all this painting with some build time! As always - you're a beast knocking this stuff out so quickly! Looks fantastic. If anything, you could get away with more white/yellow, maybe carried up onto the turret itself. Looking great ! And the Gun Grave has re-surfaced too ! It must be nearly Christmas. OMG so much win right there. Love it! Nice. I love the weathering on the armor skirts. Is that freehand on the side I spy??? Very nicely done. Love the medley of colours on this. Looks very cool mate. The skin with purple is also a really nice touch. @Frothing Muppet: Thanks man! I tried to sketch some 'genestealer spine' motifs on the side armour but just couldn't get the look right. @The GunGrave: I appreciate it! @Col. Ackland: Thanks! I admit a weakness for the KV-2 look! @Dai: A little bit, I can usually manage a numeral or two without mucking it up too badly but that's about the extent of it. Hah! Love it! It's so great I wanna loot it! @Greg Hess: Hah! Thanks man - it already has a half-orky vibe to it with the big slab-sided armor! Cannot recommend Blood and Skulls kits enough, he does excellent add-ons! Great work on it! The blue armor looks fantastic as well as the chipped paint. 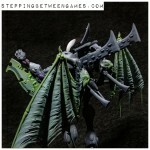 I especially like the purple on the acolyte's skin, very sinister looking.